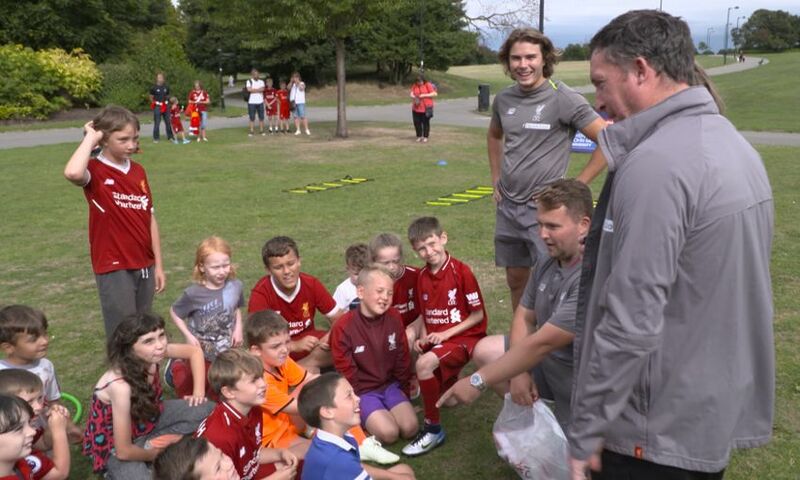 Liverpool legend Robbie Fowler surprised families at the launch of LFC Foundation's 'Open Goals' activity programme in Stanley Park. As a prank, the former Reds striker was introduced as the new LFC Foundation coach who would be helping with the session, much to the surprise and confusion of the families taking part. Once over the initial shock, the families joined Robbie in games of rounders, mini-tennis and relay races, and both kids and their parents enjoyed asking him questions about his career and having their photograph taken with him. Open Goals is a programme of free sports and physical activity sessions that take place every weekend in public parks across the Liverpool city region, run by coaches from LFC Foundation. Each session includes a variety of family-friendly games and activities, such as quick cricket, ultimate frisbee, orienteering games, hot potato, cat and mouse, bean bag throw and frisbee golf. Jean Twine, who brought her four sons to the park to enjoy the Open Goals session, said: “My kids loved taking part in the Open Goals session today; they’re a great excuse to get my kids away from the TV, and outside in the fresh air having fun together as a family, and socialising with other kids. We’ll definitely be coming back. Open Goals sessions take place in local parks around Liverpool each weekend, including Stanley Park, Doric Park, Wavertree Sports Park, Walton Hall Park, Belle Vale Park, Norris Green Park and Jubilee Sports Bank. LFC Foundation has also scheduled several additional sessions during the summer, to keep families active during the school holidays. Open Goals sessions are open and inclusive to all abilities and skill levels, and focus on family-friendly activities, not just football. LFC Foundation’s Open Goals project is funded by the Premier League and PFA Community Fund, which supports Premier League club community schemes in creating positive social change within their local communities. Liverpool John Moores University is supporting the Open Goals programme, by providing funding to support the training and management of the volunteer programme for LJMU students and staff. For more information about Open Goals sessions, visit the LFC Foundation’s website.